There are many sleep disorders that can prevent you from sleeping well and getting the sleep that you need. The list of about 80 sleep disorders is long and varied. Some problems keep you from being able to sleep well at night. Others prevent you from being able to stay awake during the day. Insomnia is the most common sleep complaint. It involves an inability to fall asleep or stay asleep. Roughly one-third of adults have temporary symptoms of insomnia. But less than 10 percent of adults are likely to have long-term, chronic insomnia. Another common sleep disorder is obstructive sleep apnea. OSA is a sleep-related breathing disorder that occurs when your muscles relax during sleep. As a result, soft tissue in the back of the throat collapses and blocks the upper airway. This obstruction causes repeated pauses in breathing that disrupt your sleep and put stress on your body. Narcolepsy is a form of hypersomnia, a group of sleep disorders that involve severe sleepiness. It involves repeated episodes of daytime naps. Sudden and irresistible “sleep attacks” may occur in unusual situations. 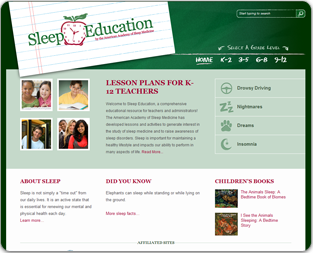 The first symptoms of narcolepsy often appear during the teenage years. Teens also are at risk for delayed sleep phase disorder. This is a type of circadian rhythm sleep disorder. It occurs when your typical sleep pattern is delayed by two or more hours. As a result, you go to sleep and wake up much later than most people your age. Parasomnias are undesired behaviors that occur during sleep, as you fall asleep or as you wake up. Common examples include sleepwalking and nightmare disorder. An extreme example of a parasomnia is REM sleep behavior disorder. People with RBD act out action-packed dreams as they sleep. They may punch, kick, jump or get out of bed and run. All of this occurs while they are still asleep. Sleep-related movement disorders involve uncontrollable movements that are disruptive to sleep. One of these disorders is restless legs syndrome. It involves an almost irresistible urge to move the legs at night. Some children have sleep-related rhythmic movement disorder. They repeatedly bang their head into their pillow or mattress or rock their body back and forth in bed. Many sleep problems are common in young children. Bedwetting and teeth grinding often occur. A child may talk during sleep, have nightmares or sleepwalk. All of these sleep problems tend to go away as a child grows and develops. However, it is important to pay special attention to any persistent problems such as loud snoring. This is a key warning sign for obstructive sleep apnea. Help for anyone with a sleep problem is available at more than 2,000 sleep centers that are accredited by the American Academy of Sleep Medicine. 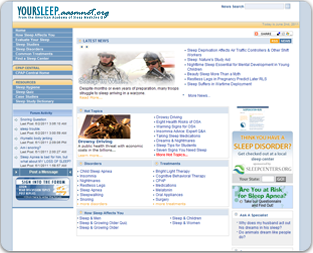 Find an AASM-accredited sleep center near you by visiting www.sleepcenters.org.